ROCHELLE PENNINGTON is an award-winning newspaper columnist and bestselling author of ten books including Highlighted in Yellow (available in four languages; co-authored with H. Jackson Brown, #1 New York Times bestselling author), The Historic Christmas Tree Ship (as featured on national television), An Old-Fashioned Christmas (2009 Midwest Booksellers Choice Award nomination), and more. Her work has been included in multiple bestselling series over the past two decades. Pennington has worked as a consultant providing story and quotation recommendations to several of the publishing industry’s most noted authors including Jack Canfield of Chicken Soup for the Soul, H. Jackson Brown of Life’s Little Instruction Books, Dr. Richard Carlson of Don’t Sweat the Small Stuff, and Alice Gray of Stories for the Heart. Pennington is both a lively storyteller and an entertaining lecturer. Her popularity as a presenter to schools, libraries, historical societies, corporations, hospitals, retirement facilities, and civic organizations is evidenced by the many invitations she receives to return and speak on further topics, ranging from history’s most memorable stories, complete with fascinating trivia, to motivational engagements highlighting courage, determination, and personal strength. She expertly weaves the perfect balance of humor, charm, and riveting facts into her captivating performances which focus on “the best of humanity.” Audience members depart with inspiration to apply the principles presented to their own lives. Pennington has delivered more than 2,000 speeches over the past twenty years. She speaks at 150 events annually. A few of her recent performances, as well as past performances, are highlighted below. If you would like to schedule a speaking engagement, call 1-800-503-5507 or e-mail pennington@powerweb.com. To view a few of her program options, please click on the “Program Brochure” link at left. Scroll to page 2 of the brochure by using the lower right arrow. Publicity photos are available by clicking "Contact" (above left). The author resides in Wisconsin with her husband of thirty-seven years. They have two grown children and three grandchildren “so far.” In her free time, she enjoys spending weekends at her family’s 100-year-old vintage “up north” cottage (CLICK HERE FOR PHOTOS) just south of the Porcupine Mountains in Michigan’s Upper Peninsula. The author’s next title, Where the Hammock Hangs, due for release in 2018, celebrates Pennington’s first seven summers beside the waters. The book includes extensive history on Lake Superior’s lighthouses, sunken ships, copper mines, logging camps, and lodges. Cherishing Children: Taking Time for Togetherness is the author’s most recent release. The book’s opening and closing essays may be read HERE. award-winning newspaper columnist, and bestselling author. Her exhausting schedule of presentations speaks to her ability to continually captivate audiences. It might be an auditorium filled with students (she is actively involved with education), or a local library. or a small thank-you dinner for volunteers. she brings the same inspirational enthusiasm. you find Rochelle ready to enlighten. Pennington was welcomed onto stage with the above words by the President of the Neenah Woman's Tuesday Club in 2017. It was Pennington's seventh invitation to address members of this well-respected, hundred-year-old organization. “I remember well the truly outstanding lecture Rochelle Pennington delivered at the American Geographical Society Library on the Shackleton expedition. The account she so dramatically portrayed was truly the best presentation of an explorer’s account that I’ve heard—ever—in my long career of attending such programs, as a geographer specializing in polar science. I was very fortunate to have been there to hear and see the event." 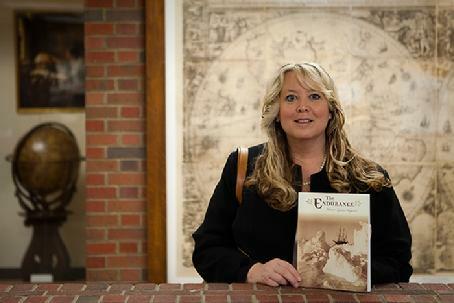 Rochelle returned to the American Geographical Society Library to deliver her “Wreck of the Edmund Fitzgerald” presentation. 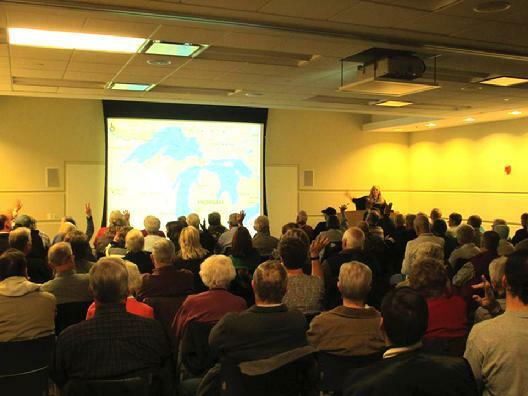 This program included information on the Great Lakes and featured extensive information on Lake Superior specifically. The audience size exceeded Rochelle's previous visit and was record-setting for the venue. Veteran librarian Jovanka Ristic included these words in her introduction to the lecture: "Our packed audience this afternoon attests not only to the public's continuing interest in the Edmund Fitzgerald story, but also to Rochelle Pennington's popularity as a powerful speaker." Following Pennington’s speech, members of the Great Lakes Captains Association referred the author to the International Shipmasters Association. The author was invited to deliver the keynote address at the annual conference (photo below). 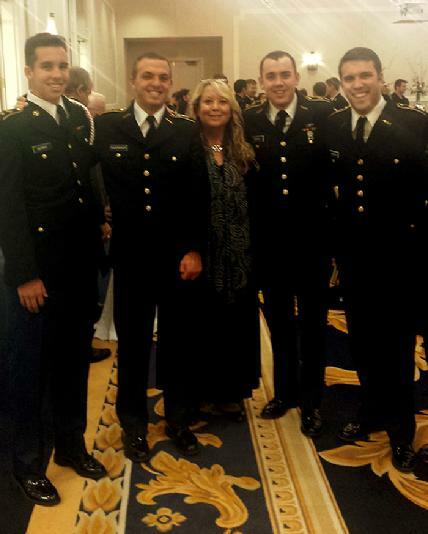 Additionally, she was referred to the U.S. Coast Guard Auxiliary and spoke at that organization’s conference also. Pennington was further honored to be invited to deliver the keynote address at the annual United States Coast Guard Auxiliary Conference in March of 2014 on referral recommendations. Pennington will be speaking to members of the United States Power Squadrons at their 2018 conference. Below photo: Rochelle Pennington spoke to the Lifelong Learners in 2012. Pennington was invited to deliver the keynote address to nearly 200 attendees of the University of Wisconsin’s 45th Annual HCE Educational Conference. She is one of the best speakers we have ever had. Very entertaining! So exciting! Presenter gave a fascinating talk. Would like to hear her again. Very well-educated in subject. The best keynote speaker I’ve heard in the years I have been coming to this event. Very knowledgeable. Her research is remarkable. After the regional conference above, Pennington was invited to deliver the keynote address at the organization’s 2018 state and 2018 national conventions. Attendees of these events participate in workshops, which emphasize education and leadership development. 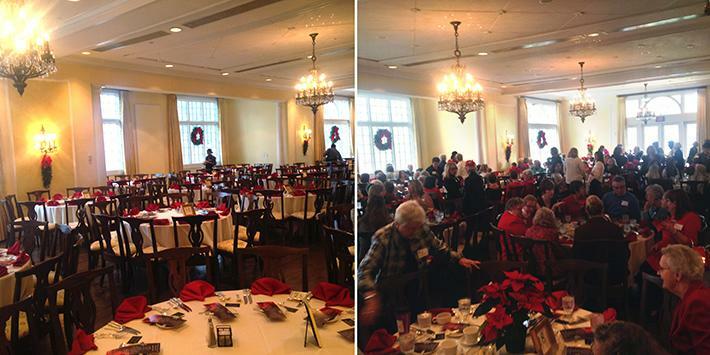 "Learning, Leading, Serving - Enhancing Our Leadership Skills"
Rochelle Pennington was invited to return to the Dallas Woman’s Club during the holiday season to deliver another lecture in the grand auditorium. Previously, she had been royally welcomed by this organization when she presented her “Christmas Tree Ship” program to members of the prestigious Mary K. Craig class. 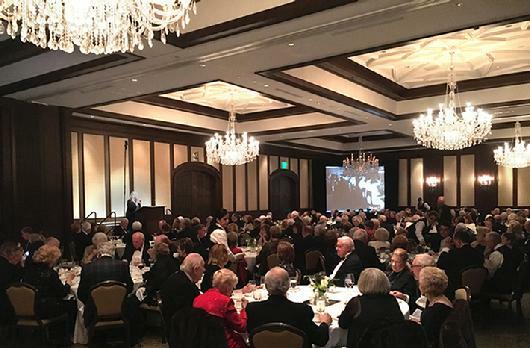 Rochelle again returned to Texas to speak to members of the Dallas Knife and Fork Club at their Black-Tie Dinner at the recommendation of the Dallas Woman's Club (photo below). Pennington speaks to members of many woman’s organizations annually. She is looking forward to addressing the National Society of Colonial Dames of America in 2018. Pennington was honored to speak to 700 members of the Lansing Town Hall Lecture Series to benefit the Lansing Symphony Orchestra. The lecture was followed by a luncheon banquet. "Dear Rochelle, It was pure joy to meet you! Your presentation touched the hearts of so many in our audience! Your warmth and graciousness was a gift to us all! Thank you so much! 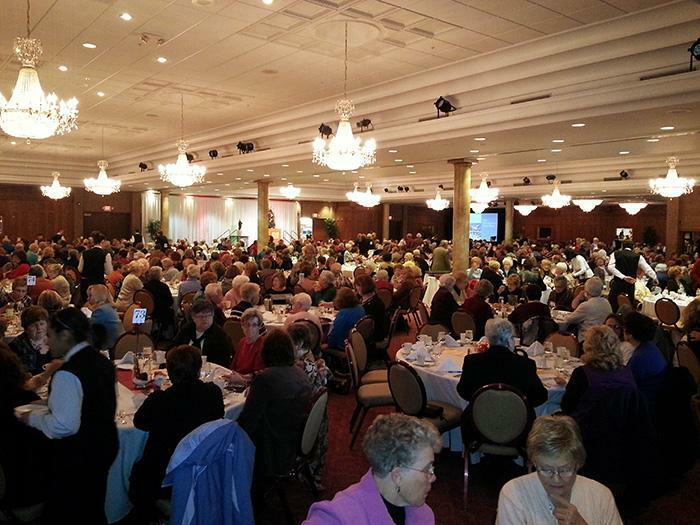 Blessings, Carol Dooley, President"
"Dear Rochelle, We had a great response to your presentation from our patrons! Thank you so much for sharing the fruits of your labor! 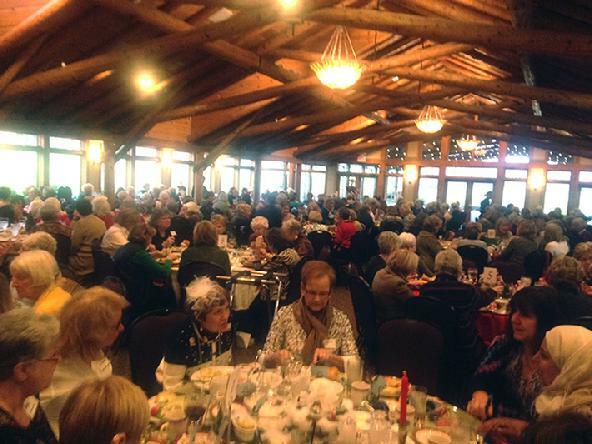 Sue Miller, Treasurer"
300 members of AAUW gathered at the Hawk's View Country Club in Lake Geneva to enjoy a holiday luncheon and inspirational keynote speech by Rochelle Pennington. Proceeds from the event benefited the organization's scholarship fund. "Hi Rochelle, Raves continue to pour in on your Christmas Tree Ship presentation! You continue to inspire audiences! Joan Davis, Program Committee"
Rochelle was thrilled to be selected as one of four lecturers chosen annually to address members of the Trumball Town Hall. 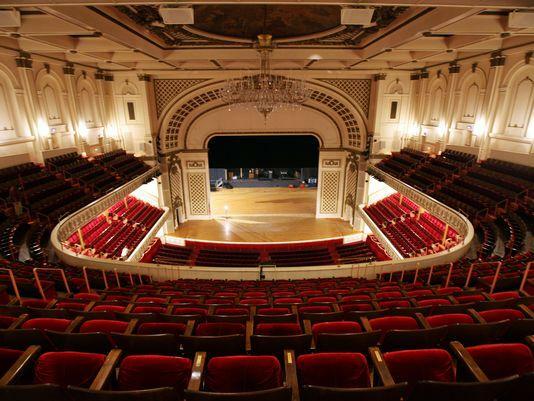 Events are held at the Packard Music Hall in Warren, Ohio. Rochelle was invited by members of the Sunnyside Guild Lecture Series to speak to an audience of 270 at a sold-out fundraiser for St. Margaret's Hospital. 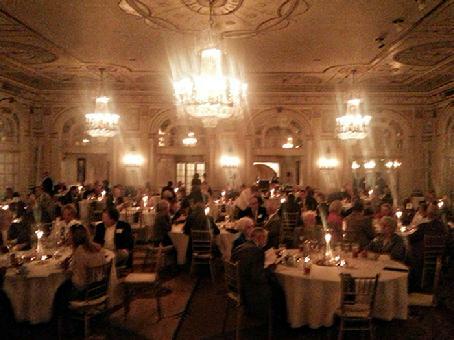 The event was held at the historic and elegant Woodstock Club. Pennington has addressed thousands of members of various town halls and lecture organizations over the past ten years. Above photo: Pennington spoke to 950 members of the Horizons Town Talk at the Horizons Conference Center during their annual speakers series. Five presenters are chosen annually to address this audience. Included among those chosen for the season Pennington was invited were Hollywood legend Joan Collins (of “Dallas” fame) and Candy Crowley, CNN’s chief political correspondent and Presidential debate moderator. Additionally, Pennington was one of five speakers chosen to address hundreds of members of the Pontiac/Oakland Town Hall for their annual lecture series at the St. George Greek Orthodox Cultural Center in Bloomfield Hills. Pennington previously spoke to a sold-out audience of 450 members of the distinguished Livonia Town Hall Lecture Series during their holiday season and returned to speak to a sold-out audience of 700 members of the Downriver Town Hall Lecture Series during their holiday gathering on the recommendation of the Livonia members. Rochelle’s presentation was preceded by a speech from Morgan Fairchild, actress, and followed by a lecture from Martha Raddatz, international journalist. 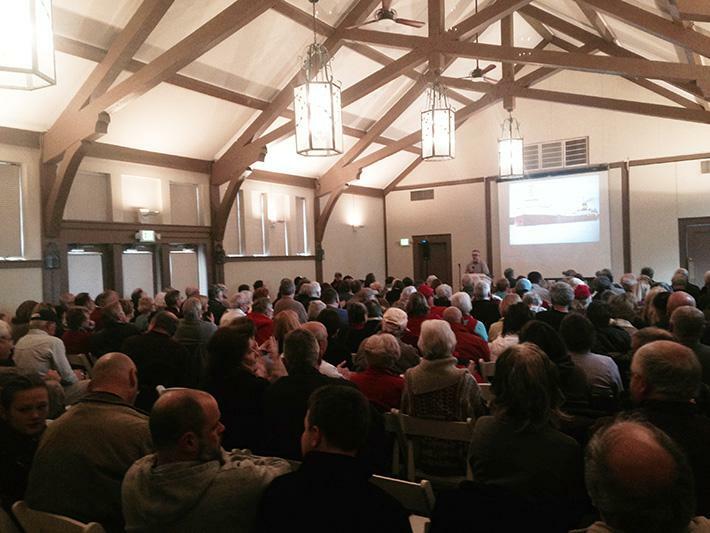 The Downriver Town Hall event was held in Southgate, Michigan at the Crystal Gardens (photo below). A luncheon banquet followed Pennington’s speech in the lecture hall, and an hour long question/answer period followed the luncheon. Update: Pennington is returning to the Downriver Town Hall in 2018 to deliver her “Endurance” speech. The author is equally thrilled to be addressing 500 members of the Margaret Waterman Alumnae Town Hall lecture series in 2018. Pennington was deeply humbled to be asked to deliver one of the two keynote addresses to audience attendees at a benefit which raised thousands of dollars for wounded warriors in November 2014. The event was held on the Notre Dame campus in the Morris Inn ballroom. After Pennington's November 2014 Notre Dame speech, the author was invited to return to the university to speak to students at a special annual leadership course. 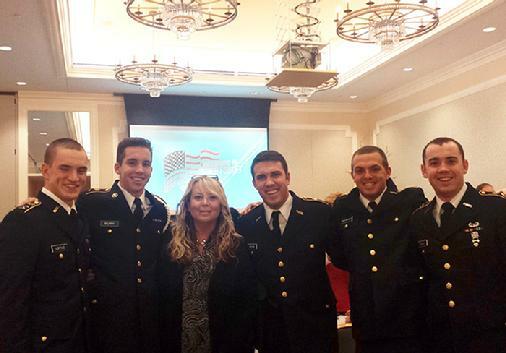 CLICK HERE to read three of Rochelle Pennington’s newspaper columns honoring military service. (Two of these columns appeared as weekly features during the Christmas season in earlier years.) Also included are two additional columns on freedom. Pennington regularly speaks at museums and historical societies. The photo below was taken at a recent gathering of the Sheboygan Falls Historical Research Society members. Pennington has spoken to the membership of this organization many times over many years. She is returning twice in 2018 for events. Pennington was honored to receive an invitation to teach at the Monteagle Assembly, one of America’s oldest chautauquas, founded in the 1800s, and located on the Cumberland Plateau in southeastern Tennessee. Chautauquas were established across America to promote spiritual and intellectual nourishment in the arts, theater, literature, and public affairs, and to further ecumenical, inter-denominational religious studies. She was a guest at the historic Edgeworth Inn during her stay. Her delivery of two separate lectures to the Monteagle community was preceded by a lecture from Jon Meacham the week prior. Meacham is a New York Times #1 bestselling author, an executive editor at Random House, a professor at Vanderbilt University, and a winner of the Pulitzer Prize. Update: Pennington returned in 2017, and she was invited to return again in 2018. Pennington has delivered many presentations in the 1864 Civil War church on the historic grounds of the Naper Settlement. One of Pennington’s programs, “Stories Behind Our Most Loved Hymns and Carols,” delivered in the vintage sanctuary, was based on the author’s research as an accomplished musician (organ, piano, guitar). Pennington has also served as a children’s choir director and has written (and directed) many worship service dramas. Several of her published dramas for children and adults have been widely performed. Two of her adult dramas alone, “Bethlehem Speaks” and “Jerusalem Speaks: Voices in the Shadow of the Cross,” have been presented in over a thousand churches nationwide. Pennington's dramas have been listened to by a quarter of a million churchgoers. Rochelle was invited to return to Naper Settlement to speak twice in 2017. Nearly two hundred community members, along with members of the local Dickens Fellowship, packed the Stephenson Public Library to hear two presentations delivered by author Rochelle Pennington, one presentation on Charles Dickens writing his masterpiece, “A Christmas Carol,” and the other on the famous “Edmund Fitzgerald.” Chairs were set up in between shelves of books to make room for everyone. Pennington delivered her “Endurance” lecture to members and guests at the church’s annual spring luncheon in 2017. 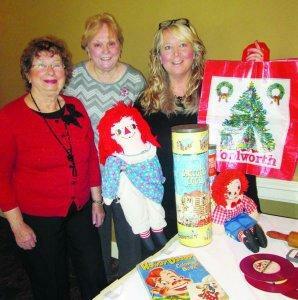 A record-setting audience for the Palos Heights Public Library (along with a waiting list) greeted Rochelle Pennington when she delivered her “Christmas Tree Ship” program during the Christmas 2017 season. Rochelle Pennington has been a repeat presenter at the Door County Maritime Museum, one of the premier maritime facilities on the Great Lakes. The two photos above were taken at the author’s Christmas 2017 lecture, her sixth invitation over the past dozen years, and the photo below was taken at her 2015 lecture. Pennington delivered her powerful “Wreck of the Edmund Fitzgerald” presentation in 2015, in honor of the 40th anniversary of the Fitzgerald’s disappearance in November 1975. She additionally was hosted at another noted nautical facility, Northern Great Lakes Visitor Center, in 2015. 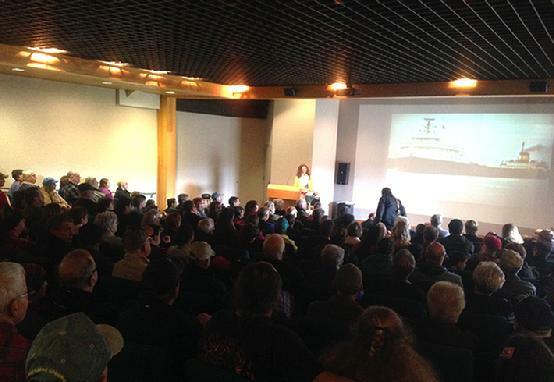 Pennington's newest program, "Wreck of the Edmund Fitzgerald," was attended by a standing-room-only audience in the Northern Great Lakes Visitor Center’s auditorium in 2015. When auditorium seats ran out, 75 chairs were set up in the aisles and along the room’s borders. When available chairs were filled, overflow attendees either stood or sat on the floor for the entire presentation. 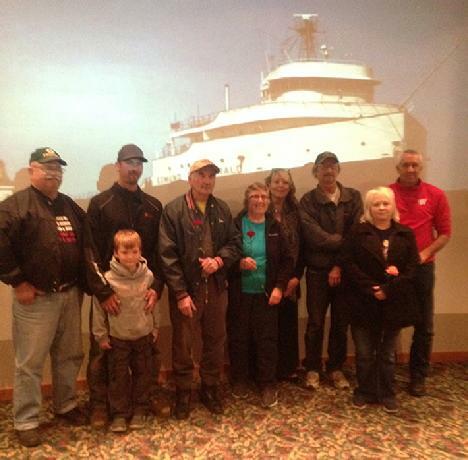 The author was deeply honored to meet family members and descendants of the lost crew (photo below) afterward. Pennington was hosted by the S.E.A.S. 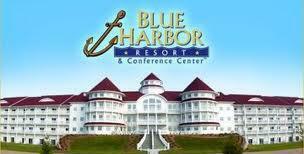 organization at the beautiful Blue Harbor Resort, located on the shores of Lake Michigan. The author presented her Fitzgerald lecture. It was the fourth year in a row for Pennington to return to this location. She was first hosted by the resort in 2012 to tell the tale of the Christmas Tree Ship legend to diners in the resort’s elegant Latitude 43 restaurant. Pennington’s podium was set in front of a massive wall of windows overlooking Lake Michigan, where waves were still rolling in following a record blizzard which hit the day prior. A full-house greeted Pennington on her return in 2015. The banquet room she typically presented in during earlier years was filled to capacity and nearly one hundred additional people were waiting outside the door. The entire event needed to be moved to a larger banquet space fifteen minutes before the speech began. Update: S.E.A.S. invited Rochelle to return in 2016 and 2017. 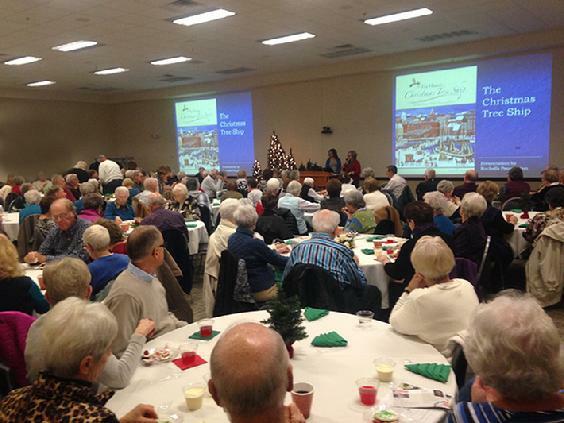 Three hundred attendees were presented at Pennington’s back-to-back presentations at Plymouth Place in November 2017. Registration filled to capacity and a waiting list for attendance was put in place. The author has been invited back three years in a row to larger audiences each year. Pennington has repeatedly been invited to Oak Park Place’s ten communities to present programs to residents, as well as to guests from the outside community. She just returned in 2018 from delivering presentations at the company’s locations in Iowa and Minnesota. Pennington has been called “the crowd’s favorite” at the Renaissance Academy of St. Xavier University. The author’s lectures pack the hall. The photo below was taken at the Christmas 2017 gathering. It was Pennington’s sixth invitation. The author is already booked to return in 2018 and 2019. Another full-house audience greeted Rochelle Pennington at the Burlington Historical Society where she has been the program presenter at the Society’s annual Christmas gathering for the past nine years in a row. 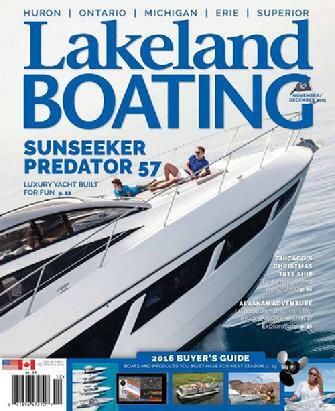 A Special Nautical Note: Pennington was honored to be interviewed by “Lakeland Boating” magazine, a widely respected publication known as “the voice of the Great Lakes for more than six decades.” Two separate articles in the magazine’s Nov/Dec 2015 issue featured the author’s writing and research on the Christmas Tree Ship and the Edmund Fitzgerald. 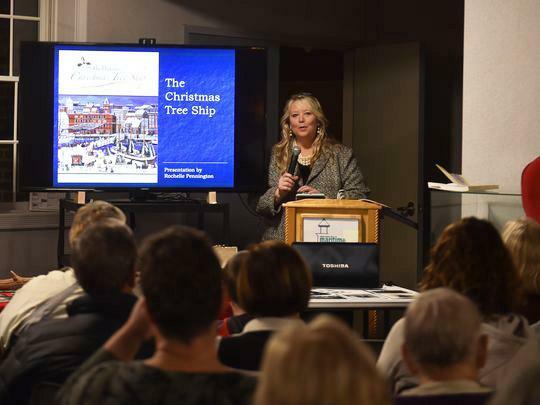 Pennington was also interviewed by the magazine "50 Plus News and Views" in December 2015 for her research on the Christmas Tree Ship. Pennington has delivered many speeches over the past fifteen years to volunteers during “thank you” luncheons/dinners. (Rochelle herself has been a Hospice Hope volunteer to the terminally ill since 1996.) The subjects of kindness and generosity are frequently addressed in the author’s books. Please see a few excerpts from Rochelle’s books below. CLICK HERE to read the story "Kindness Matters." CLICK HERE to read three additional writings on the subject of kindness and generosity. Update: Rochelle will be speaking at the annual volunteer banquet for Froedert Hospital and the Medical College of Wisconsin in 2016. Pennington has taught courses at several University of Wisconsin facilities, including multiple visits over the past ten years to UW-Green Bay. Pennington was invited back to the campus to present her “WWI Christmas Miracle” speech and her course filled to capacity immediately after being announced. Sixty-nine students asked to be placed on the cancellation list and, because of this, the event was repeated later in the year. This was a great story told by a great storyteller. Very well done. Fantastic artifacts. This presenter is amazingly well-informed. Rochelle’s preparation and knowledge are apparent to all who attend any of her programs. A very organized and interesting presentation delivered by a talented and effective speaker. 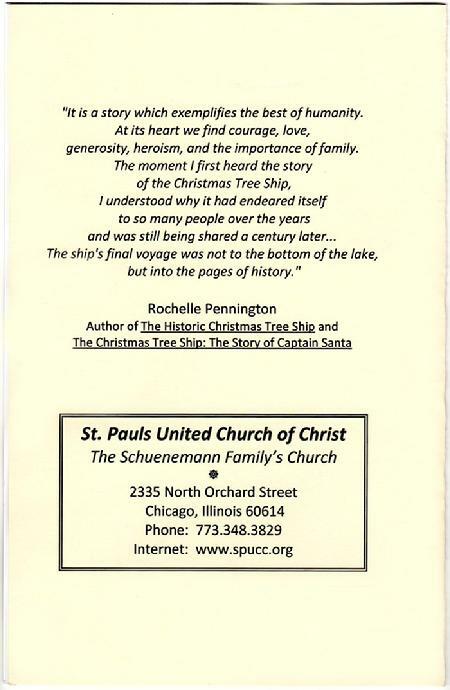 Rochelle’s program of the WWI Christmas truce from her book Christmas Gifts was a gift in itself to those in the audience. Update: Pennington will be speaking to the University of Wisconsin’s O.S.H.E.R. 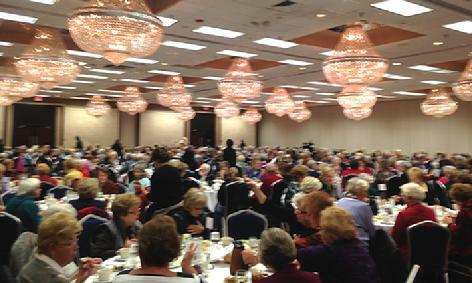 learners, a 1500-member group of retirees, in 2018. It was a special honor for author Rochelle Pennington to speak to Board Officers and Key Women Educators of the Delta Kappa Gamma Society’s Alpha Beta Chapter of Washington County. 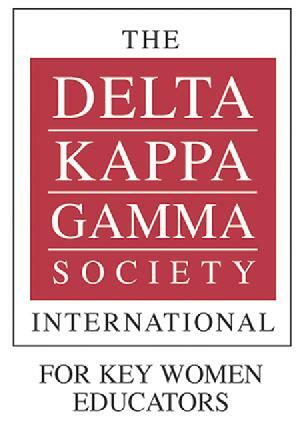 This educational organization supports young, aspiring authors and illustrators in grades three through eight and funds scholarships for high school seniors seeking to enter the field of education. Pennington addressed distinguished businessmen and women of The Executives Club in Louisville, Kentucky, on the subject of leadership. 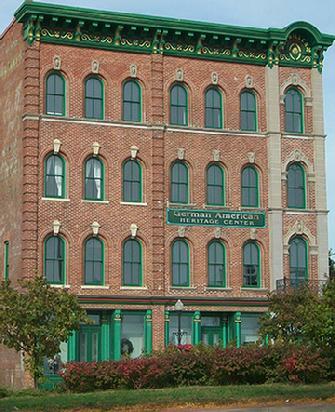 The event was held at the opulent Brown Hotel, one of Kentucky’s premier landmarks. "What a FABULOUS evening with you! It was way too much fun! The Board RAVED about you and your presentation!" 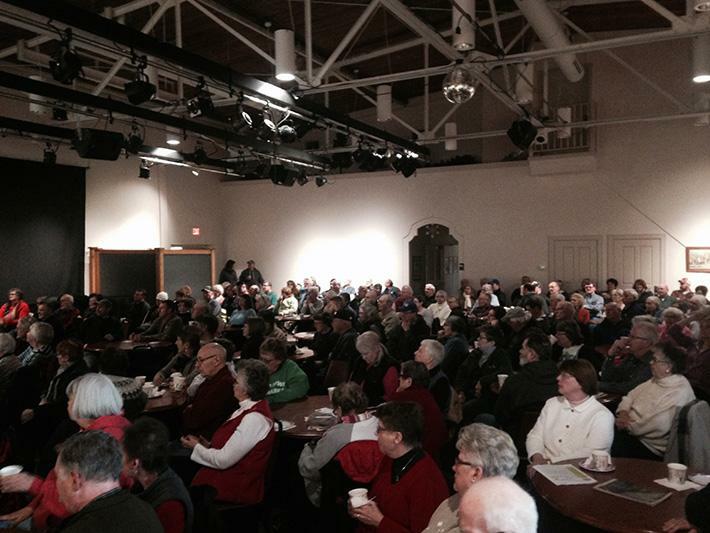 Rochelle was warmly welcomed back to the German American Heritage Center in Davenport, Iowa, during the fall of 2014. She presented her “World War I Christmas Truce” speech to historians and patrons of this fine facility for their annual banquet. 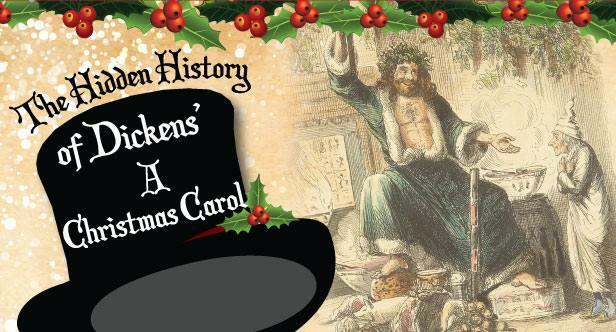 Previously, Pennington presented two speeches at the museum in 2012, each of which concluded with carol singing in both English and German. The author, a church organist for the past 40 years (since her freshman year of high school), provided musical accompaniments on a vintage piano. Rochelle delivered her keynote speech, “The Hidden History Behind Charles Dickens Writing ‘A Christmas Carol.,’” in 2014. She was the honored author of that year. 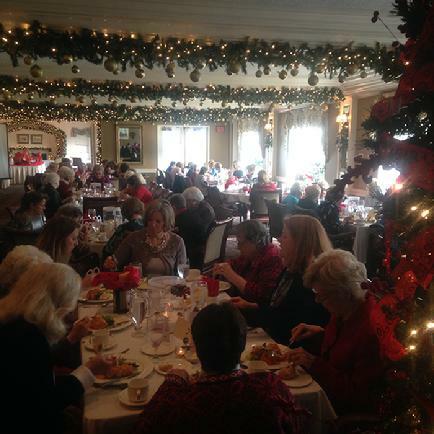 Rochelle is pictured above with attendees of the Christmas tea, including writer Dennis Uhlig, who is also a retired English teacher and bookstore manager. Mr. Uhlig has been a dear friend of Rochelle's since her first column, Insights and Inspirations, appeared in Wisconsin newspapers in the mid-1990s. Insights and Inspirations was followed by a weekly feature, As I See It, which was later followed by A Look at Life. Mr. Uhlig's bookstore hosted Rochelle's very first book-signing event in 2001 when her Highlighted in Yellow title was released. Pennington’s recent programs to banking clubs have included presentations to the Vernon Hills Bank & Trust, Oak Lawn Bank & Trust, Wintrust Bank of Chicago, State Bank of the Lakes Antioch, First National Bank of Evergreen, and the Beverly Bank & Trust. The photo below was taken in October of 2017 at the Ruth Lake Country Club. The gathering was scheduled for patrons of the Hinsdale Bank & Trust. 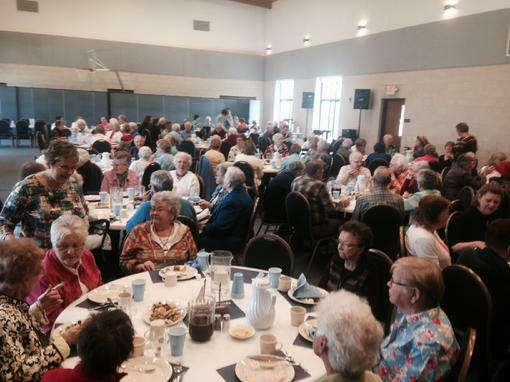 There were 130 guests in attendance. National Exchange Bank invited Rochelle Pennington to be our guest speaker for our annual fall seminars we host for our customers that are age 55 or better. I chose Rochelle because I had read an article about her a few years before and had purchased her book “Believe in Yourself” (which sits in my office when I need inspiration). The response to the seminars entitled “A Walk Down Memory Lane” was over-whelming, to put it mildly. We scheduled three seminars and had to add an additional seminar due to the many requests to attend. In 25 years, this was our most attended seminar. Rochelle captured the audience with her humor, charm and touching stories coming from her heart. She had people in the audience with tears in their eyes as they related to her stories. After her presentation they lingered to visit with Rochelle and share time with her. I received many phone calls thanking the bank for presenting this uplifting program and still am receiving calls asking for her contact information. She most definitely will be back at National Exchange presenting another program in the near future. Rochelle’s inspirational presentation left us recalling many memories of the wonderful life we had and still enjoy today! Thanks for the memories, Rochelle! If you have additional questions or concerns please contact me. You will not be disappointed with Rochelle as your speaker. 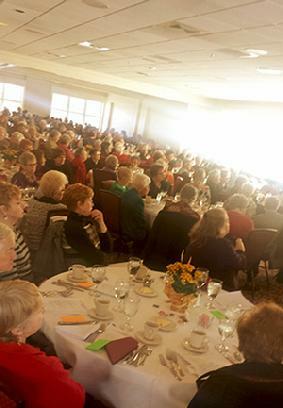 200 seniors spent the afternoon listening to author Rochelle Pennington’s Endurance presentation at Plymouth Place, La Grange, Illinois, a premier retirement community. 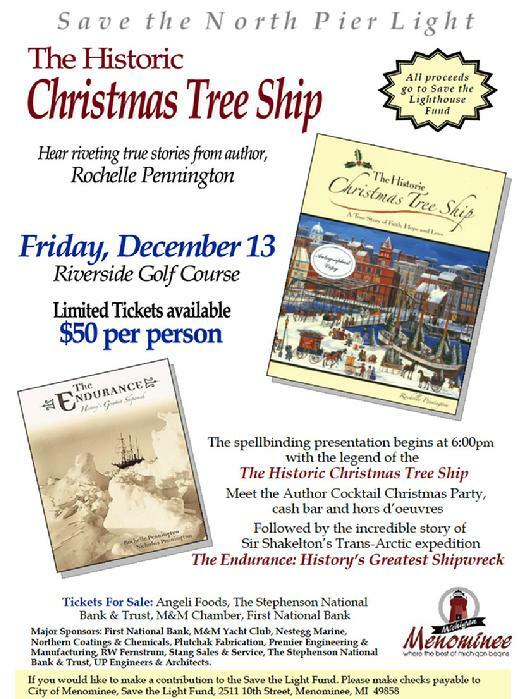 Rochelle returned to Plymouth Place twice to present her programs "An Old-Fashioned Christmas" and "The Wreck of the Edmund Fitzgerald." Pennington is a frequent speaker at many, many woman's clubs. Update: Pennington returned in 2017 to address the club’s membership and is scheduled to return again in 2018. First Presbyterian Church of Neenah (photo below), First Presbyterian Church of Glen Ellyn, Hales Corners Lutheran Church, Mount Olive Lutheran Church, Steeple View, First Presbyterian Church of La Grange, St. Dominic Catholic Church, Ladies Guild of Emmanuel Lutheran, St. Matthew’s Lutheran Church, Campus Life, Faith United Lutheran Church of Gillette, United Methodist Church of Whitefish Bay, Community United Methodist Church of Elm Grove, Our Lady of Ransom Catholic Church of Niles, Presbyterian Women of Arlington Heights, St. John’s Lutheran Church of New Fane, St. John’s Lutheran Church of Lannon, St. Raphael’s Catholic Church of Naperville, Palos Park Presbyterian Church, Palos Heights Christian Reformed Church, and Faith Christian Reformed of Elmhurst. Pennington will also be speaking for the fifth time at the Midwest Congregational Woman’s Fellowship Annual Retreat in 2018, as well as for the second time at the annual retreat of the Missouri Synod S.E. District Wisconsin Lutheran’s membership. Pennington is a frequent speaker at many libraries. Standing-room-only audiences have greeted the author at many locations. "La Crosse Public Library wholeheartedly endorses the talents of Rochelle Pennington. We had her deliver her program 'A Walk Down Memory Lane' to a rapt audience of over 90 older adults, many of whom were reluctant to let her pack up at the end of her presentation to leave. We plan to have her back again to do another one of her many offerings. For an entertaining and professional program, hire her! You'll be glad you did." Update: Rochelle is scheduled to return to the La Crosse Public Library in 2016. She previously presented programs in 2011, 2012, 2013, 2014, and 2015. 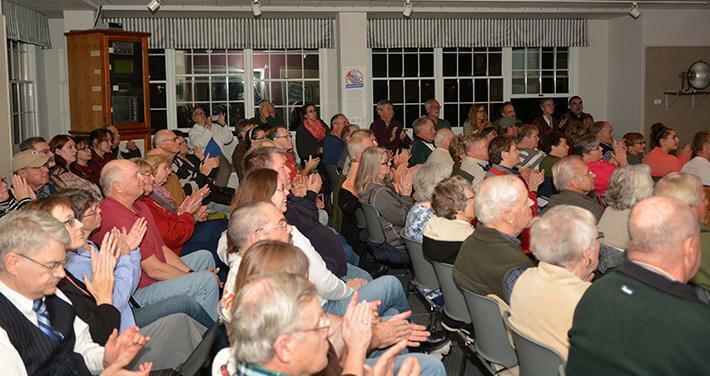 Over a hundred patrons from the Cudahy Family Library, a record-setting audience for this small library, attended Pennington’s “Fitzgerald” lecture in March 2016. The author was invited to return to the library in Spring 2017 to present her “Endurance” speech. Another nearby library, Whitefish Bay Public Library, also had a record-setting audience for Pennington’s “Fitzgerald” lecture three months prior. 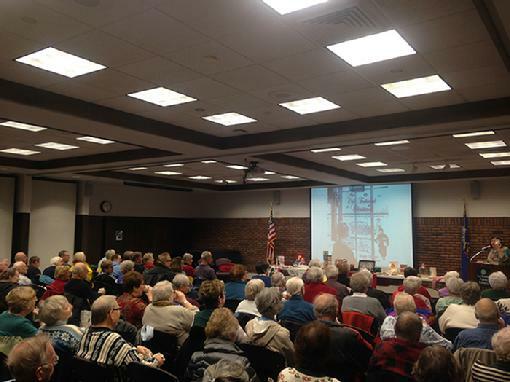 A packed house greeted Pennington at the Orland Park Public Library in November 2015. It was the author’s fourth speech at this facility. Update: Pennington will be returning to the Orland Park Public Library in September 2016 to deliver her “Endurance” lecture. 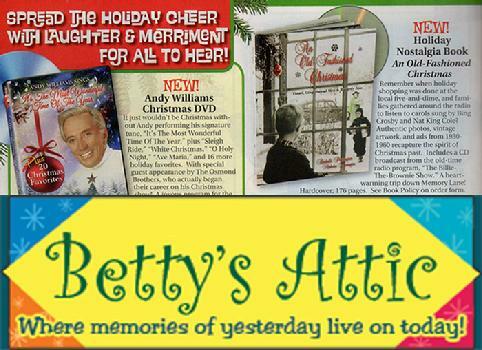 Pennington’s holiday title, “An Old-Fashioned Christmas: Tinsel, Gingerbread Men and Raggedy Ann,” which details the Christmases of yesteryear between 1930 and 1960, was featured in the 2014 holiday editions of the nationally circulated Betty’s Attic catalog. CLICK HERE to view “Tea Time” promotion. 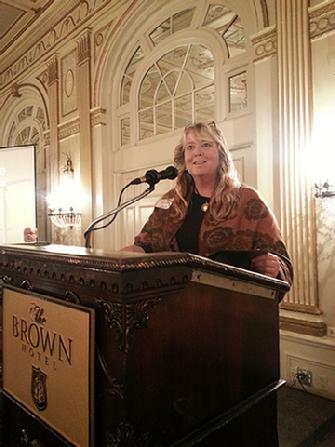 Pennington delivered her “One Nation Under God” speech in Madison to members of the Wisconsin Chapter of DAR. It is the second time Pennington spoke at the State Convention in the past seven years. 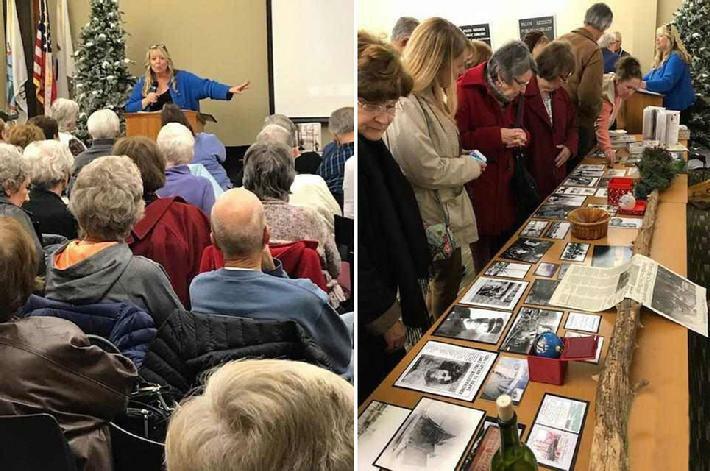 Pennington presented her “World War I Christmas Miracle” in 2013 to patrons from 28 branches of the Cuyahoga County Library in Ohio. Her presentation was held at the library’s newest location during the facility’s grand opening week. 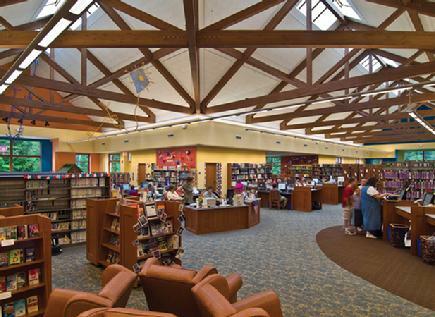 Pennington has presented hundreds of programs at libraries in many states over the past fifteen years. 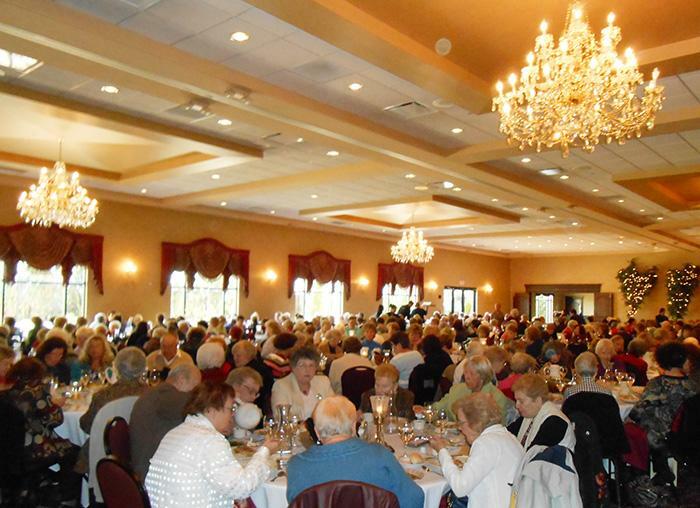 Pennington delivered her “A Walk Down Memory Lane” speech in 2013 to members of the Woman’s Club of Wheeling, West Virginia at the historic Osiris Temple, and also delivered this same speech in 2013 to members of the Four Arts Club in Elkhart, Indiana. Rochelle was deeply honored to accept the National Exchange Club’s invitation to speak at their annual convention. The National Exchange Club is America’s oldest service organization and is committed to the betterment of our communities, our families, and our country. The club promotes Americanism and is dedicated to teaching our country’s rich heritage through the distribution and display of our founding documents. 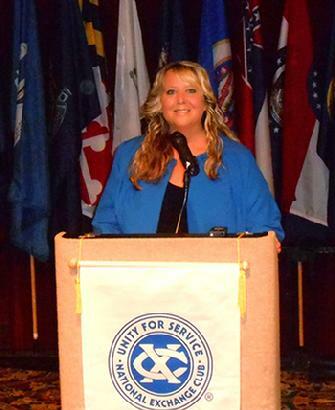 Rochelle Pennington was the keynote speaker at the National Exchange Club’s annual convention in Greensboro, North Carolina in 2013. Seven hundred members representing clubs from across America were in attendance. Photos above: Rochelle Pennington is pictured above left with her high school English teacher, Mrs. Barbara York, in 2004 at a book signing event, and on the right in 2013 at the awards ceremony. Menominee, Michigan Save the Lighthouse! What a memorable evening! 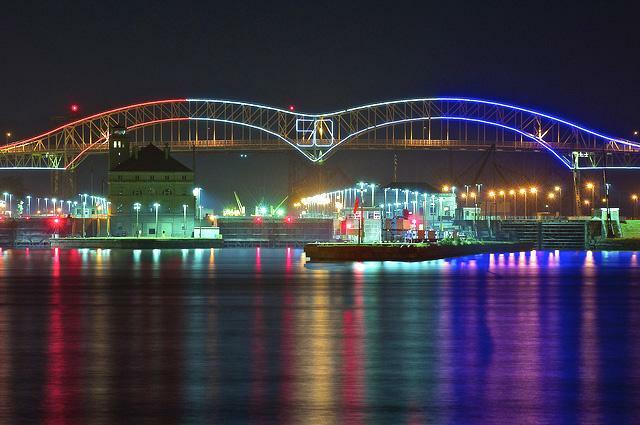 Pennington presented her “Christmas Tree Ship” program in Sault Sainte Marie, Michigan to celebrate the 50th anniversary of the International Bridge connecting Canada and Michigan on June 28, 2012. Guests on board the dinner cruise were treated to a roast turkey feast with all the trimmings while their vessel was captained by “Santa Claus.” The event ended with a sky of fireworks as the bridge was illuminated from end to end. Photo above by Andrew Kuehl, Editor and Publisher of The Statesman. The Statesman announced Pennington's forthcoming book signing at The Candy Tree with the words, "These days Rochelle Pennington could use Santa's sleigh and reindeer to help her reach destinations where she is making personal appearances. Last week, the author signed books and spoke in three different states in four days." 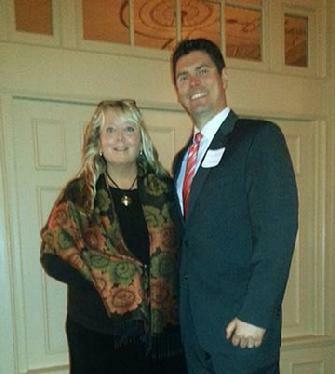 Rochelle is pictured with Chris Jung, owner of The Candy Tree. It has become “tradition” for Rochelle to visit St. Thomas Aquinas School and deliver her holiday Christmas Tree Ship program to students there. “Rochelle, Today’s presentation was again outstanding! The students were enthralled! They asked Mr. Rick if they could work on writing their play tomorrow so that they could remember everything you told them!" The photo below was taken at Blesch Intermediate School. 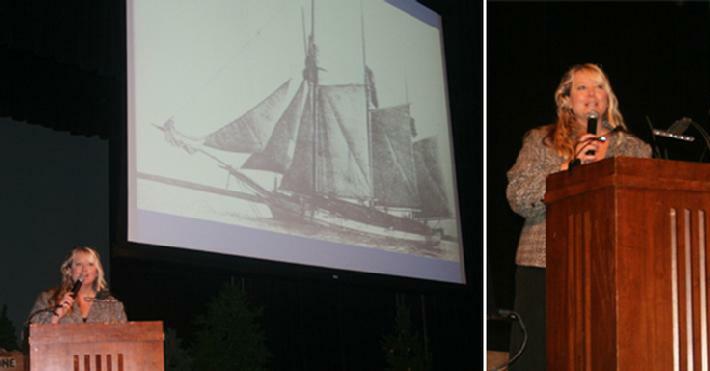 Rochelle delivered her program on the legendary Endurance shipwreck to nearly 500 students. News release: Pennington's title, "The Christmas Tree Ship," is now available in Braille. The launch of the new book was made possible by a generous donation by the Livonia Town Hall to Seedlings Braille Books for Children. The Livonia Town Hall is dedicated to philanthropy and chose Pennington's book as one of their 2012 service projects after the author delivered her lecture to members during the 2011 Christmas season. 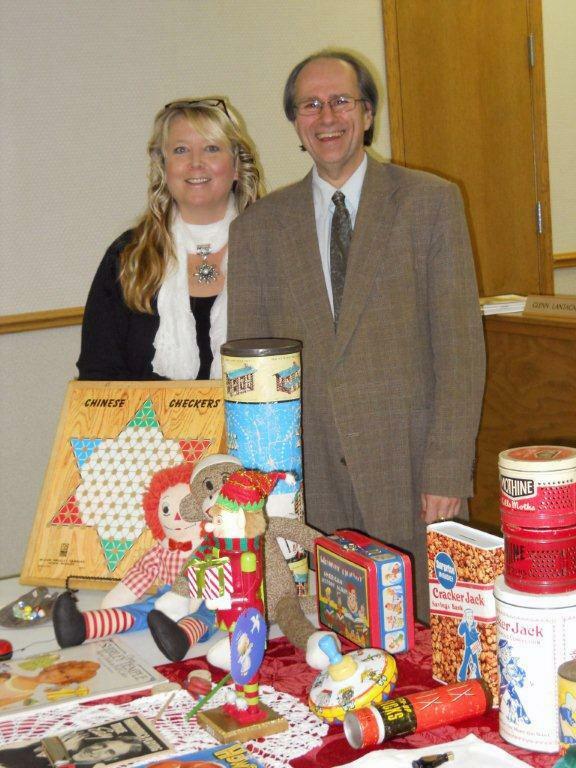 Christmas came early to patrons of the Niagara Public Library when Pennington showed up with a sleigh full of vintage toys (a trunk full, actually) and presented her program “An Old-Fashioned Christmas.” Pennington has been invited three times to this library over the past decade. "Rochelle Pennington magically transported her audience at the Niagara Public Library back to Christmas past, specifically focusing on the ‘30s, ‘40s, and ‘50s. I highly recommend Rochelle for any of the presentations that she does. She is highly professional and delights audiences with her sparkling personality and deep knowledge of her subjects." 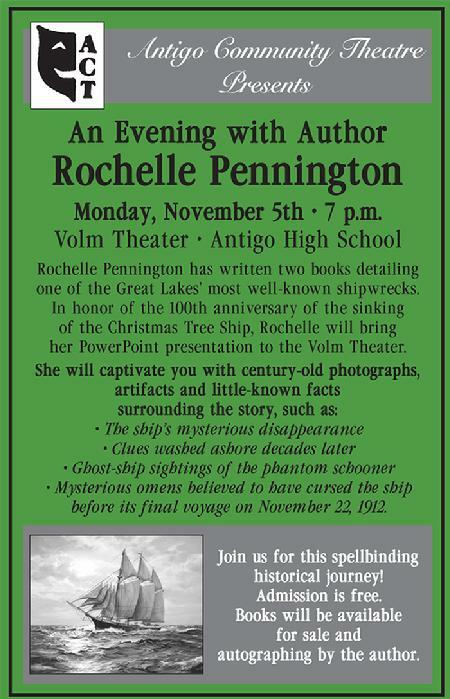 Cast members of the Antigo Community Theater invited Rochelle Pennington to present her “Christmas Tree Ship” lecture on the eve of November 5, 2012 in the Volm Theater. 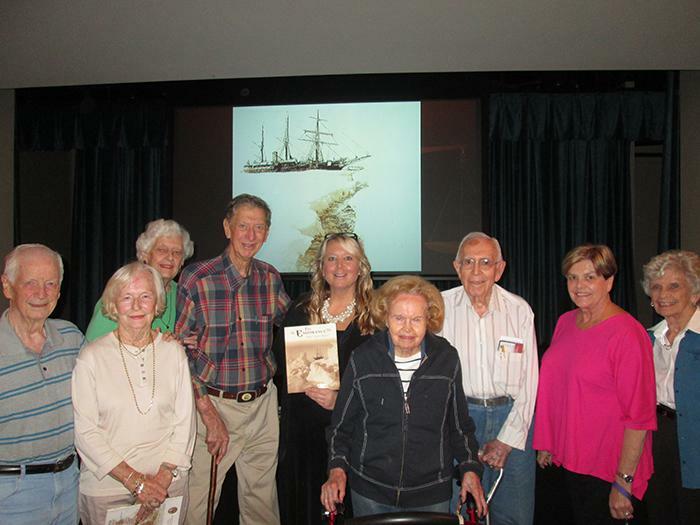 Pennington’s event was held in conjunction with the theater group’s production of the musical “The Christmas Schooner,” based on the story of the Christmas Tree Ship. The musical was performed under the leadership of the group’s director, Moira Scupien. It is the second time Ms. Scupien has provided the artistic leadership of this musical for her community. (The first performances were held in 2007, at which time Pennington was also present to deliver her historical program about the ship featured in the musical.) Pennington’s evening presentation at the Volm Theater followed an all-day event with seven one-hour workshops for nearly 400 middle school students who were going to attend a special presentation of the musical the following day. Peter Hirthe (left), President of Wisconsin Marine Historical Society, Rochelle Pennington, author, and John Enright (right), Curator Emeritus at North Point Lighthouse and Board Member of the Wisconsin Marine Historical Society, standing next to the 800-pound Milwaukee harbor fog bell that once served at the Milwaukee harbor entrance. Pennington presented her "Christmas Tree Ship" program at the historic lighthouse. Two of Pennington’s all-time favorite programs over the years were delivered at other historic Great Lakes lighthouses on stormy eves. 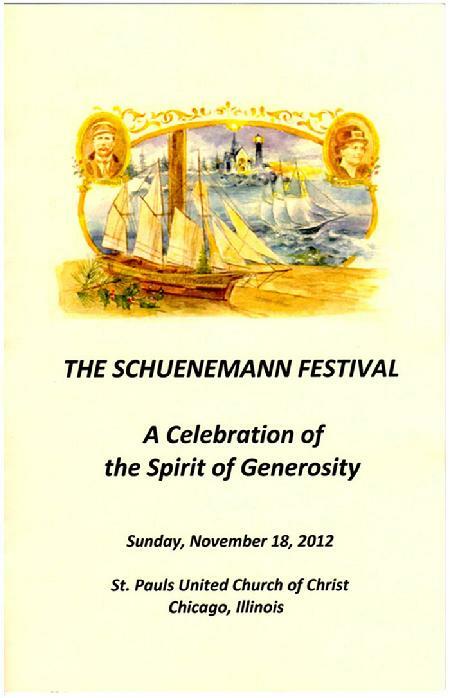 The archives at St. Pauls are filled with references to the many kindnesses and acts of generosity done by Captain Herman and Barbara Schueneman, as well as by their children. Rochelle Pennington was honored to be present during the all-day festivities which included a memorial worship service, a musical, educational programs, historic exhibits, and a German feast. The front and back covers of the church’s commemorative booklet are below. 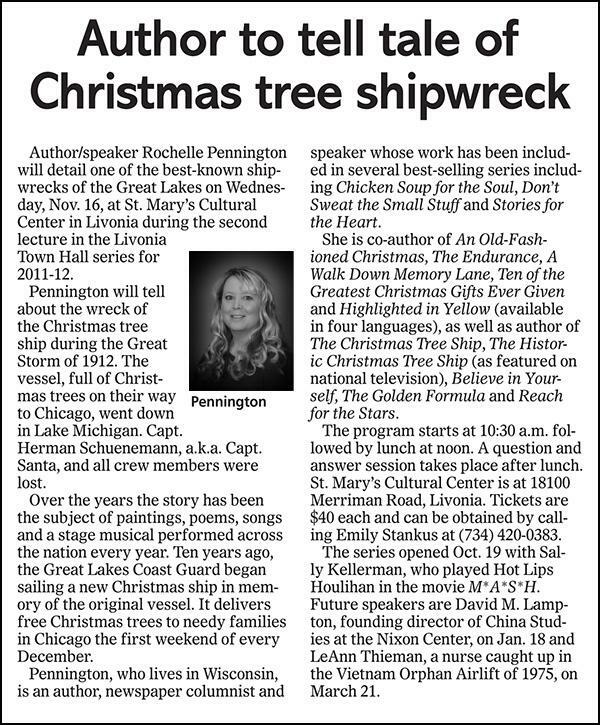 Author Rochelle Pennington was a featured guest at the 100th anniversary celebration of the Christmas Tree Ship in Two Rivers, Wisconsin. 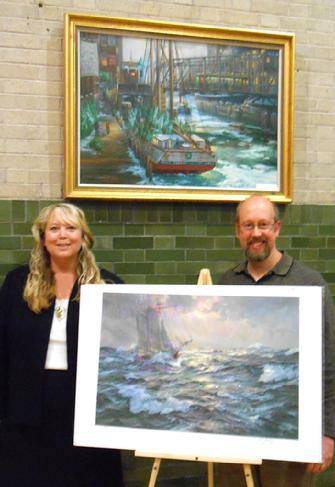 Also in attendance was Eric Forsberg, one of America's foremost nautical painters. Forsberg's artwork on the Christmas Tree Ship is featured in Pennington's book "Christmas Gifts: Ten of the Greatest Ever Given." The author and the artist are currently collaborating on another forthcoming project titled "Greatest Shipwrecks of the Great Lakes," due for release in late 2019. 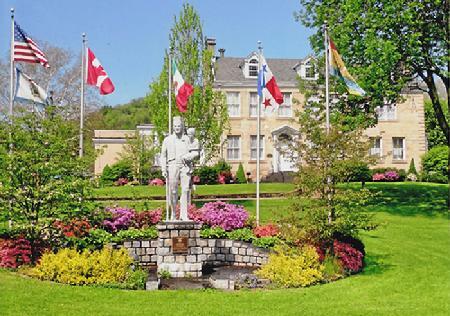 The Two Rivers commemoration event included a parade, a musical, a choral concert, a fisherman's feast, a wreath-laying ceremony, exhibits, a display of artifacts, and a reception of guest dignitaries. Rochelle Pennington is shown in the photo above left next to Dr. William Ehling. Dr. Ehling, age 82, a retired physician who traveled from central Illinois for the event, is the last surviving grandson of the original captain of the Christmas Tree Ship. He is standing beside the ship's wheel. Rochelle has travelled to central Illinois each Christmas to spend time with the descendants of the original captain. The family "adopted" Rochelle over a decade ago when she was doing her research. Dr. Ehling reminds Rochelle always, "You are a daughter to me." In the photo above right, the eldest great-granddaughter of Captain Santa of the Christmas Tree Ship, Barbara Ehling from Illinois, is shown furthest left, standing with (from left to right) Maggie Becker-Koeppe of Two Rivers, Wisconsin, Rochelle Pennington, and Laurel Jasmin of Manistique, Michigan. 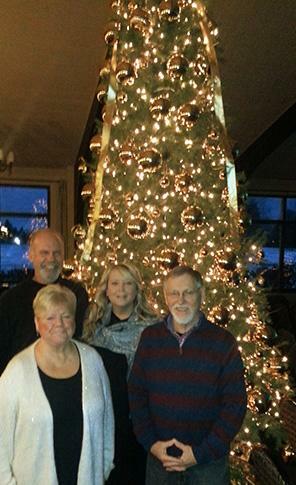 Laurel Jasmin is the Chairperson for the Christmas Tree Ship Advisory Committee in the State of Michigan. She and her team were directly responsible for the 2006 placement of the State of Michigan historical marker honoring the Christmas Tree Ship. Mrs. Jasmin stayed with the Pennington family during her three-day stay in Wisconsin. Maggie Becker-Koeppe was Chairperson of the Wisconsin 100th Anniversary Celebration in Two Rivers. Pennington returned to Clement Manor Center for Enrichment for the fifth year, this time to deliver her “Christmas Tree Ship” presentation to another packed audience. The author worked with The Weather Channel in 2003 for a television special which featured the historic Yuletide ship. The Weather Channel’s production has aired nationally every Christmas since 2004 as their Storm Stories holiday offering. Pennington was interviewed multiple times during this previous documentary. 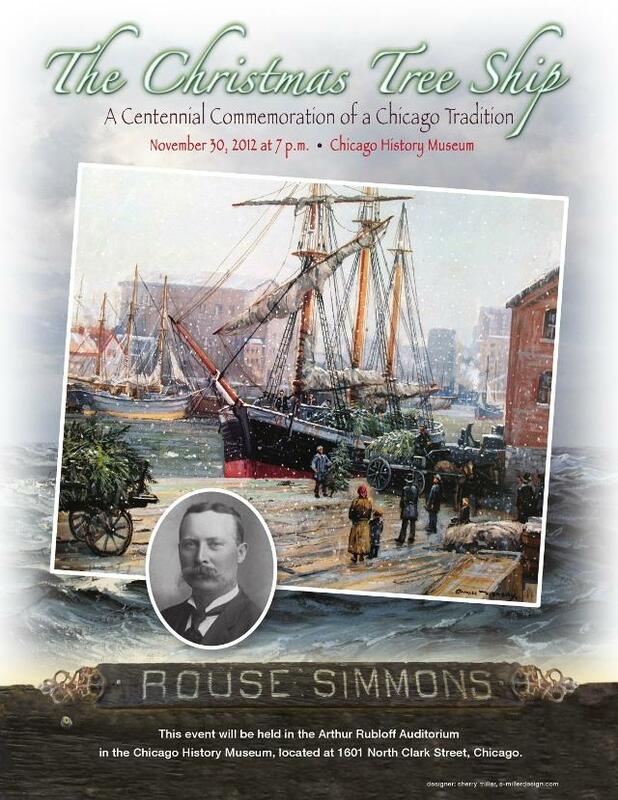 Rochelle Pennington was one of the featured presenters at the Chicago History Museum’s centennial commemoration ceremony honoring the loss of the original Christmas Tree Ship in 1912. Rochelle Pennington was invited to present the Christmas Tree Ship story to the entire Crivitz Elementary School. The author presented back-to-back programs all day to hundreds of enthusiastic kindergarten through sixth-grade students. In the evening, she presented the story at a dinner banquet to Board members of the Crivitz Public Library, Board members of the Northeast Reading Council, and members of the Crivitz Women's Club. Pennington was honored to be invited to be a storyteller as part of the entertainment to over a hundred children at this annual gathering. 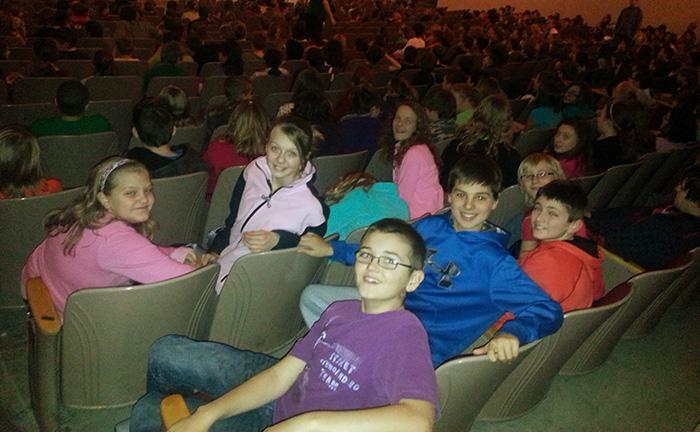 250 sixth-grade students listened attentively to Pennington’s telling of the Christmas Tree Ship story. The author answered an entire hour’s worth of questions from the students following her speech.